Technology has just reached maximum on the relaxation scale. The multi-functional Jimmy Collection will amaze you with each touch of the buttons that are at your fingertips. 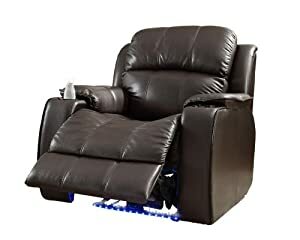 One push begins the chilling process in the cup holder, the next push starts the massage function, another push lights up the floor with a cool blue LED lighting panel and the last push gently eases you into a reclining position. The collection is offered in Black or Dark Brown bonded leather.